The Royal Canadian Mint is celebrating the Loonie’s 30th birthday with a two-coin silver proof set for collectors. The Royal Canadian Mint’s new two-coin set commemorates the 30th anniversary of the Loonie. The first coin features the classical Loonie design by Canadian artist Robert-Ralph Carmichael. The second coin depicts Emanuel Hahn’s Voyageur design that was originally intended for the dollar coin. As shown, a voyageur paddles at the stern, while an Aboriginal paddles at the bow; between them lies a bundle of wrapped furs, while stylized vertical rays above represent the Aurora borealis. On June 30, 1987, Canadians were introduced to an 11-sided $1 dollar coin for circulation, which was quickly dubbed "the loonie" because of its reverse or tails side design. The bronze-colored coin was the most significant change in Canada’s currency system in nearly 50 years. More than 13 billion of them have been produced to date. "It’s very fitting that during Canada 150, we are also celebrating one of the country’s most recognizable symbols," said Sandra Hanington, President and CEO of the Royal Canadian Mint. Struck in 99.99% pure silver, the two coins of the set have different reverses with one bearing the classic loonie design and the other showing the Voyageur design that was originally intended for the one-dollar coin. "Had the original dies not vanished in transit, our one-dollar coin would have featured the Voyageur image that first appeared on a dollar coin in 1935," the Royal Mint describes. 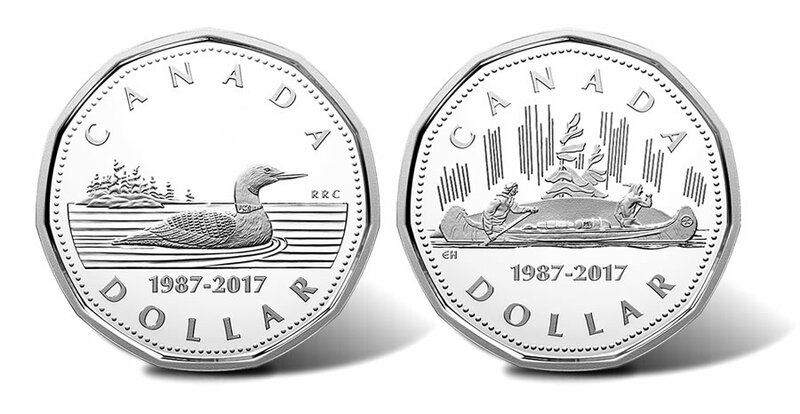 Both coins share reverse inscriptions of CANADA, 1987-2017, DOLLAR, plus "RRC" or "EH" to denote the artist’s initials. The coin obverses bear the Susanna Blunt effigy of Her Majesty Queen Elizabeth II along with inscriptions of ELIZABETH II, D G REGINA, and SB for the artist’s initials. 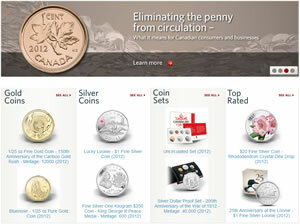 Priced at CAD $79.95, or about US $56.50, the set is available from the Royal Canadian website at mint.ca. The two coins are encapsulated and presented side-by-side inside a clamshell case. These are nice, but small, approximately 1/4th ounce silver dollars. A little over $4 worth of silver in each coin. But, they are Proofs. Is the website listed in this article an “affiliate” link that provides a 5% fee to the publisher from RCM? No affiliate link in this article. The Mint sent us a media statement about the set’s release and it had a quote that we used, so I didn’t think it would be fair to add our affiliate link. 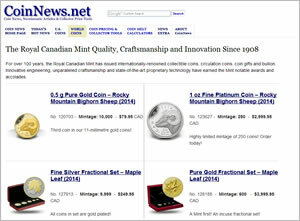 The RCM also released a 2-coin set of gold with selective platinum plating coins, 1 oz each, for ~ $4k USD ($5499 CAD). It’s really beautiful. I would love to see that,even a picture. I could never afford it though(I bet only few people can).The 30th Anniversary of the Loonie I have though and I think they are very nice.I;m 54 but truly like Canadian History Thanks R.C.M.